Welcome to Angelo Mandato’s home on the Internet. Feel free to browse through the pages and please E-mail me (angelo [at] mandato [period] com) if you have any questions or comments. I’m the CIO and co-founder of RawVoice, a Internet media company as well as host of Plugins Podcast, lead coordinator of PodCamp Ohio 2008, 2009 and 2010 as well as freelance web developer and consultant. My skills include application programming (C++/wxWidgets), web programming (C++/PHP/MySQL/jQuery), WordPress CMS theme/plugin development, server administration (Linux), project management, blogging and podcasting. This blog serves many purposes; as a forum for me to speak my mind on topics I am passionate about, as a historical journal of my life, and as a place for me to connect with others like yourself. Topics covered include family, history, technology, automobiles and other meaningful topics. I am a 32 year old Chief Information Officer, computer programmer analyst and server administrator in Columbus, Ohio. I spend my spare time with my family, friends, cars and of course computers. I’m happily married to Heather, greatest woman in the whole world. We had a beautiful baby girl in January of 2009 and are expecting a boy this June. My marriage to Heather and the birth of our daughter are the two most important experiences I’ve had in my life thus far. I’ve worked full time in the computer field since May of 2000. Over the past 10+ years, I’ve gained exceptional knowledge of networking software, Internet engineering and web development. I have excellent analytical problem solving skills which resulted in the fast acceleration of my career. I obtained a B.S. in Computer Science from Kent State University, where I focused my studies in Web Programming and Internet Engineering. While attending Kent State, I worked part time for the Residential Network where I gained valuable knowledge of network and Internet software and troubleshooting. I was employed as a Programmer Analyst for the United McGill Corporation from June of 2000 to June of 2007. At United McGill I gained valuable experience with a wide range of software languages such as Visual C++, PHP web development, Windows installers. In addition, I was involved with creating help documentation, lead the develoment of multiple projects, Windows and Linux server administrator and provided technical support for the computer departments systems and services. I am one of the original founders and the Chief Information Officer of RawVoice. Since its inception, I have had a key role with the design, development, deployment and support for all of the RawVoice services and web sites. Services include the RawVoice Generator, a Internet media network community web platform and the RawVoice Statistics media measurement application. Web sites include Blubrry.com, RawVoice.com and TechPodcasts.com. I’ve involved with developing a number of WordPress plugins and have collaborated with friend and colleague Brian Yuhnke creating a handful of WordPress themes. Plugins include the Blubrry PowerPress podcasting plugin and the Subscribe Sidebar plugin. My favorite song is The Rain Song by Led Zeppelin. Check out this acoustic no lyric version on YouTube. My favorite band of all time is The Beatles. I cannot decide on a favorite album between the White Album and Abbey Road. During the 80’s I gravitated to classic rock and oldies music. In the early 90’s, I quickly fell in love with grunge/modern rock and techno music. I’ve already come to terms with the idea that someday I’ll be just like my parents and not understand this ‘new music’. 🙂 I’m still finding new music that I like though so hopefully that day will not come too soon. I’m a big car nut. 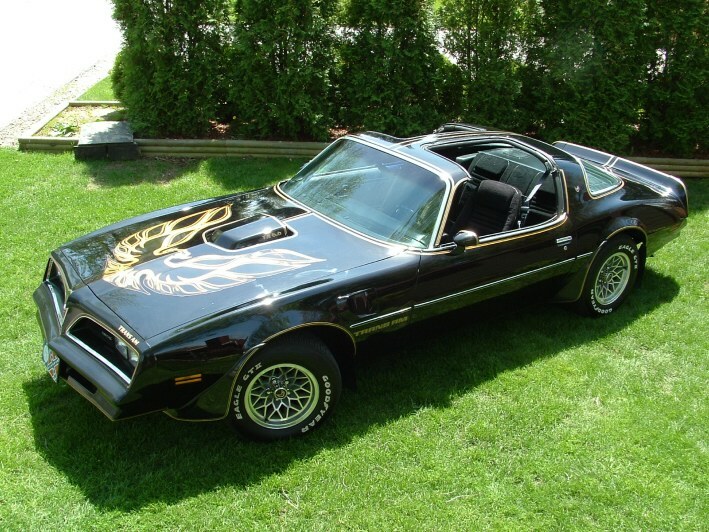 My favorite car of all time is the 1978 Pontiac Trans Am Black with gold trim and t-tops with the WS6 performance package and W72 engine option. I’ve been in love with this car since I saw the movie Smokey and the Bandit as a child. I am fully aware that there are much faster cars but childhood memories will always make this a favorite for me. As far as other classic cars are concerned, I have a great appreciation for everything Pontiac. The 1973 Trans Am Super Duty is, in my opinion, one of the most overlooked muscle cars of its time. It’s a pretty fast muscle car. I also like the last 3 years of the 1970’s GTO’s, also referred to as The Judge, and the 1989 Turbo Trans Am 3.8L V6 Pace Car to name a few. Cars other than Pontiac that I like include the 80’s Buick Grand National and Chevy El Camino. Maybe someday I’ll build an 80’s El Camino with a Pontiac V8, that be pretty darn cool! 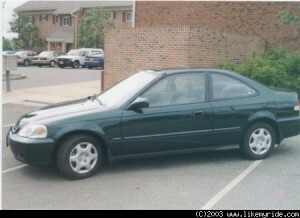 Until I purchased a little Honda Civic in 2000, my car passion would have stopped at the paragraph above. Owning a fun to drive and easy to tune little car was like a shot in the arm for a car guy like myself. These cars don’t have the same feel to the pedal (since they are 4 cylinder engines), but if control is your game, small cars are fun. I’m sure the Fiero hit this spirit during the 80’s, it’s a shame GM canceled the car. GM has done a lot of stupid things, but I will not get into that here. 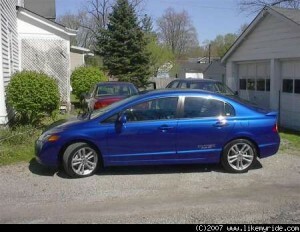 My current car is a 2007 Honda Civic Si Sedan. She is a great car! Not without flaws though, the transmission needed rebuilt, but it was all handled under warranty. She is a lot of fun to drive. Some of the important performance features include a 197 HP DOHC 4 cylinder engine (horse power nearly matches displacement), 6 speed manual transmission, sport tuned suspension, 2-tiered dashboard, and all wheel disk brakes. Pretty much everything that was missing from my first civic! I’m an optimistic that future cars are going to be a lot of fun. Hopefully our new president will help the Big Three get their head out of the SUV/big car ground and have them start thinking about making real fun to drive and innovative small cars. I think the new Dodge Caliber is a great first step and I believe that car has a lot of promise. Ford and GM need to pick up their game, the Cobalt and Focus have a ways to go to meet the expectations set by the Civic, Corolla and Sentra. Here’s a hint Big Three, think about creating performance tuned hybrids that let you run in battery mode or hybrid mode. I believe performance hybrids will be the future of sub compact car tuning. Update, looks like Honda read my page, they created a Hybrid sport compact called the CR-Z! Now that I see one, I’m not so sure it works for me. But I suspect previous CR-X owners may like the car. Now, they just need to make a version of the CR-Z without the hybrid motor, then hopefully they will have enough combined sales to keep the platform around for many years.